Today, we left Nashville for a little side trip before heading home. We had the chance to visit Memphis a few times when we lived here, but a few sights escaped our view, one of which was the Civil Rights Museum. After a divine feast of ribs at Corky's BBQ, and potentially dangerous visit to a guitar store that had just lost its lease ($7000 guitar for a mere $4000 anyone? ), we headed over to the museum. The National Civil Rights Museum is a site specific experience. The founders of the museum purchased the original Lorraine Hotel - site of Dr. Martin Luther King Jr.'s assassination - and the boarding house from which the fatal bullet was shot. 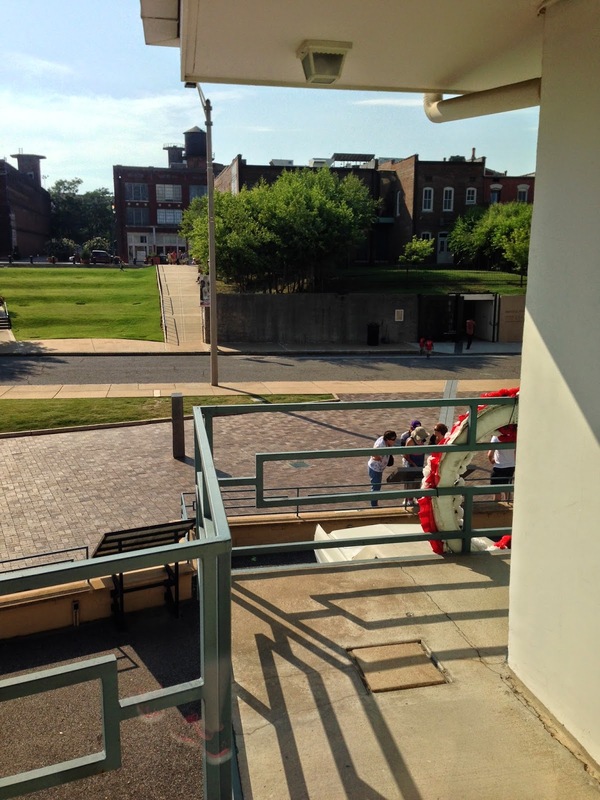 Around these historic locations, the museum was built to showcase the history of the civil rights movement in America. The Lorraine Hotel and the National Civil Rights Museum. Your first exhibit is a circular room showing the history of slavery, including a statue demonstrating the actual-sized space in which slaves would be forced to travel on the ships. (I was reminded of the powerful novel, The Book of Negroes.) From there, you enter a movie theatre with a short film explaining the major stages of the movement to overcome slavery and legal oppression. The film ends with the message that we're all moving forward in this journey, with the sounds of footsteps and an image of silhouetted people marching across the screen. Suddenly, a door slides open in the screen, and the audience is invited to join the march as we move into the larger part of the museum. What follows is room after room of exhibits, showcasing both the horrors and triumphs of humanity. Larger stories like the Freedom Riders, integrating schools, and students sit-ins are showcased. But smaller, lesser known stories about individuals and their part of the story are also shared. The museum is full of life-sized statues, showing scenes like Rosa Parks on the bus, and the Memphis Sanitation Strike. Coming face to face with these silvery, ghostlike forms brings history into reality. Words like 'disturbing', 'overwhelming', and 'inspiring' are pale descriptions of the experience. In moments, my stomach turned and my eyes welled up at the intense and bizarre cruelty. Turn the corner, and I'd be reading a story of intense bravery, and the waves of hope that act generated in the rest of society. The most powerful parts of the visit were Room 306, and the boarding house. Using police photographs, the museum has recreated both rooms to show how they would have looked on that day. In each space, we read a timeline of events, to make the experience present and palpable. We read how Dr. King was laughing and joking on the afternoon of his assassination. We see ashtrays full of cigarettes, a neat hotel room, a messy boarding house. The one detail that wasn't there on that day is the flower wreath hanging on the balcony rail, marking the fatal spot. The museum was crowded today. People of all races and ages moved through the halls, reading the stories and staring at the photos. As we walked through, I wondered how the different groups were processing the experience. As a Canadian, this isn't my history, but as a human being, this is my history. As we've traveled throughout the South, we've often visited places where you can feel a racial tension. Sometimes it's said aloud, but oftentimes it's simply felt, perhaps in the way that people make eye contact, or even more disturbingly, in the way that they won't. I wondered if we might feel that in the museum, but we didn't. Folks moved through the crowded spaces with a sense of reverence and gentleness. Children laughed and played with the statues. People gave each other space to take photos. 'Please', 'thank you', and 'excuse me' were said often. It's hard to put into words how we felt after we left the final exhibits. We spent a full 3 hours there, and we could have spent much more time. It's already spurned hours of conversation, and I have a feeling we'll be talking about it for a while yet. From Memphis, we hit the road again and headed to Little Rock, Arkansas! After a bit of schedule juggling, we realized we could take a few days and visit our friends Tara and Kyle. Feeling blessed and tired tonight.